Dog training is an essential part of raising a well mannered member of your family. At All About Dogs we have a variety of training options to meet your needs. Work with you and your dog individually. In one of our many group classes. 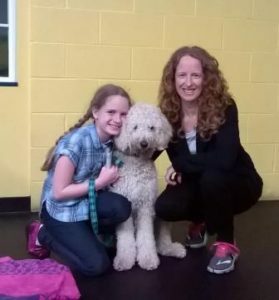 Our positive and fun approach to learning will teach you to identify your dogs individual needs and communicate effectively, building a strong relationship and a confident dog. We offer training for dogs of all ages. your dog the skills necessary to navigate in the human world. 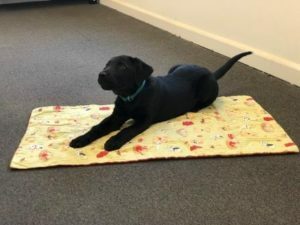 It provides an opportunity to introduce your dog to a new environment and help them learn the skills needed both at home and in the community. Check out our group training class schedule. Our trainers will provide your family with the tools needed to teach your dog how to be a well mannered member of the family. Help for a fearful or reactive dog. We can *travel to your home, meet at a local park or at **All About Dogs. $60.60 per hour at your home or neutral location. $50.50 per hour at our facility. ** Dogs training in the All About Dogs facility must meet our vaccination and health policies. Pete learning 'Go To Bed'. Are you overwhelmed with your dog's behavior? Does your schedule prevent you from joining group classes? We can work with your dog directly then teach you the cues and how to follow through. We can come to your home or work with your dog while he is boarding at our facility. You will receive a write up or email after each session with information on the skills worked and any management information. $25.25 for 30 minutes at our facility. Gibbs and the ball pit. to stimulate your dog's body and mind. This type of training can build confidence, reduce stress and help your dog learn new things more quickly which can lead to a more emotionally and physically balanced dog. Enrichment training is great for dogs of all ages and abilities.